“The Honolulu Printmakers exhibition is a wonderful opportunity for our students to exhibit with artists from all over the state,” says UH Hilo master printer Prof. Jon Goebel. “Long Run.” Madalyn Freedman. Multiple plate etching with aquatint. 6″ x 8″. 2018. “Beacon.” Jon Goebel. Drypoint and aquatint. 20″ x 15”. 2018. Click to enlarge. Printmaking talent nurtured at the University of Hawai‘i at Hilo is well represented at the Honolulu Printmakers 91st Annual Juried Exhibition. Works by alumni, a current student, and a master printmaking professor are part of the prestigious exhibition that opened Jan. 13 and remains on view at UH Mānoa Art Gallery through Feb. 15, 2019. 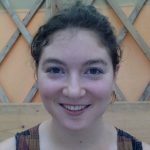 UH Hilo alumni Madalyn Freedman and Katya Hutchinson, and current student Tiana Honda, have been mentored by Professor Jon Goebel, master printer and director of the UH Hilo printmaking program. 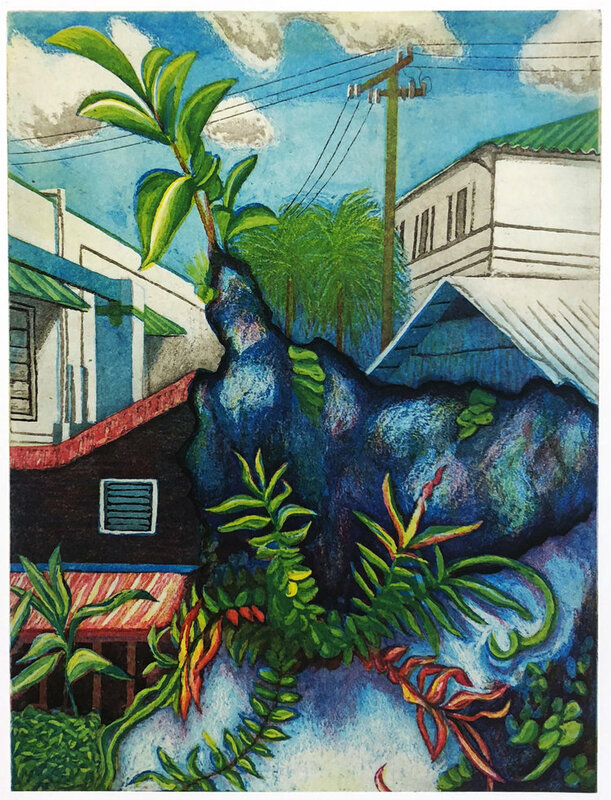 See Work of UH Hilo’s master printmaker Jon Goebel, Feb. 2, 2015, UH Hilo Stories. 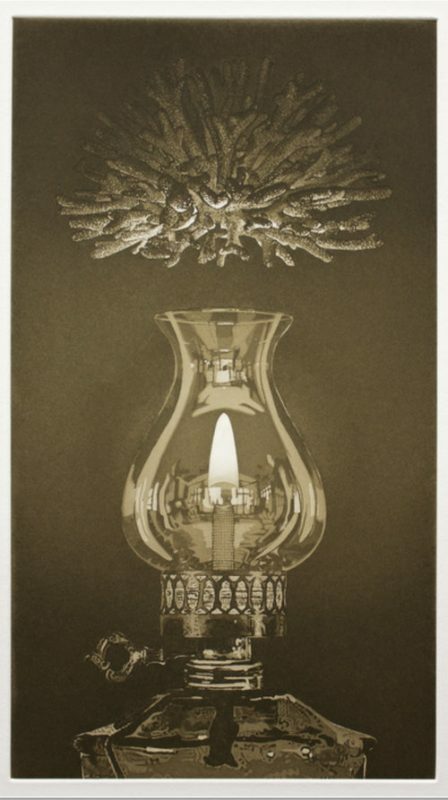 Goebel has a print in the show entitled, “Beacon,” a 20″ x 15” drypoint and aquatint print dated 2018. Reproductions and details about the rest of the group’s prints are found below. Honda and Hutchinson, in addition to the prestige of being included in the show, have already sold out their editions. “Their works are fabulous,” says Michael Marshall, professor of art and chair of the departments of art and performing arts at UH Hilo. 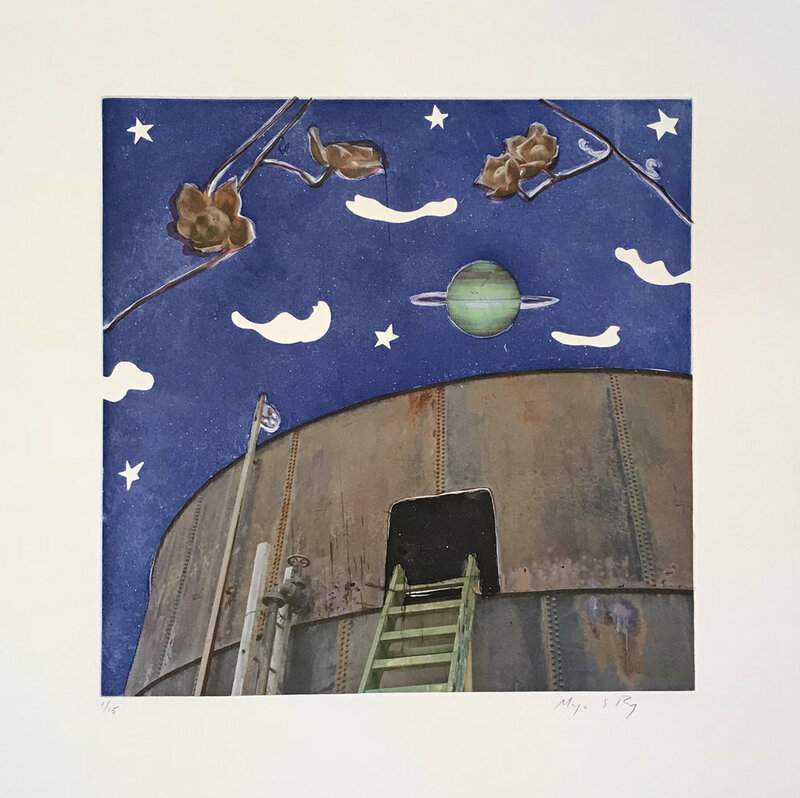 Also exhibiting in the show is UH Hilo alumna Margot Ray (Art, 2002), who is a thriving printmaker, book artist, and painter on Hawai‘i Island. 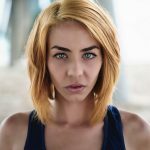 Details about her selection for the current show are found below. Goebel says the UH Hilo Department of Art has a rich history of involving students in professional development opportunities. Freedman has two prints in the show: “Long Run,” a multiple plate etching with aquatint, 6″ X 8″, dated 2018 (see image at top of story); and “Grow Beneath,” an 11″ X 8 1/4″ piece, aquatint and etching with chine-collé, also dated 2018, which received an honorable mention award at the exhibit. “Grow Beneath.” Madalyn Freedman. Aquatint and etching with chine-collé. 11″ x 8 1/4″. 2018. Honda, currently a student of Goebel’s, has a print in the show entitled, “Traveling Cats,” an intaglio etching with aquatint and gold leaf, 10.3″ x 7.8″ dated 2018. The charming print is already sold out. 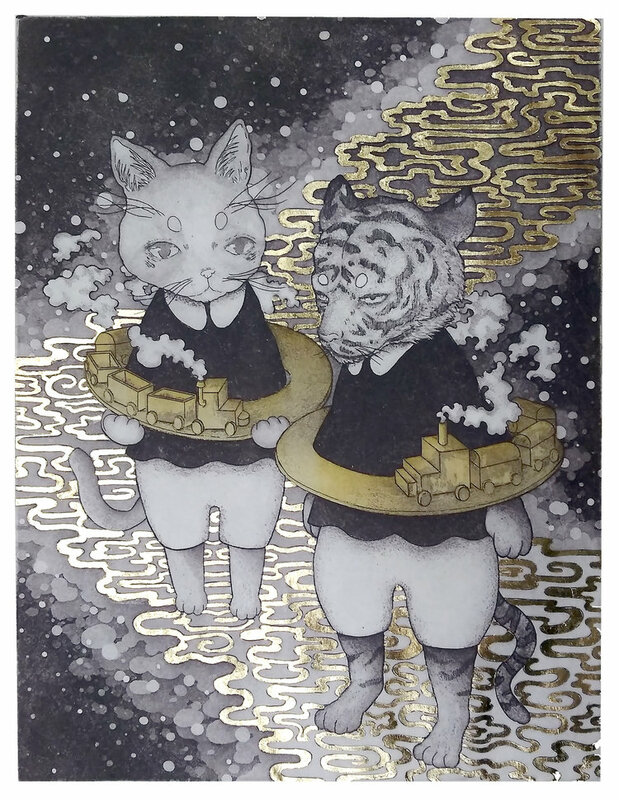 “Traveling Cats.” Tiana Honda. Intaglio etching and aquatint, gold leaf. 10.3″ x 7.8″. 2018. 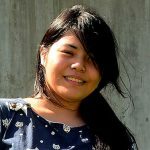 Hutchinson recently graduated from UH Hilo last fall with a degree in art and is seeking graduate school this fall. 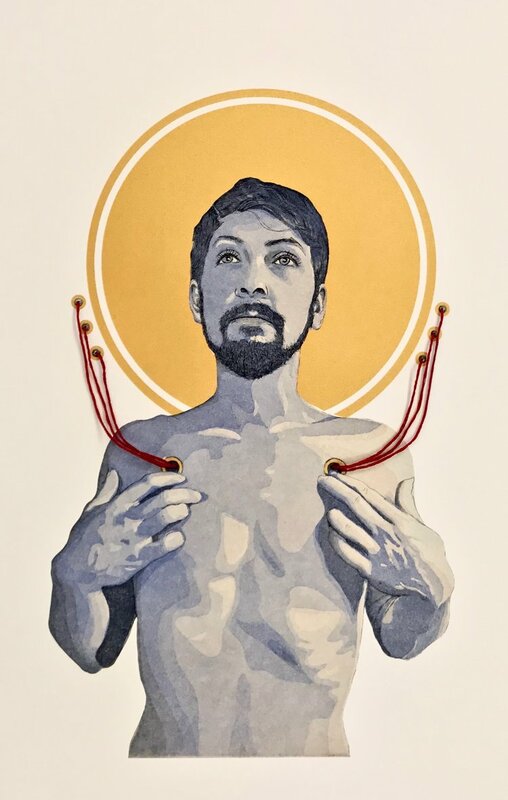 Her print, “Saint Boyfriend,” a 15″ x 11 1/2” intaglio, screen print with embroidery thread, dated 2018, was selected for the exhibit. Born and raised in Hawai‘i, Ray graduated from UH Hilo with an art degree in 2002. She has grown a highly successful career in the arts shaped in part she says by her studies at UH Hilo. To learn more about Ray’s career, see UH Hilo alumna Margo Ray, local artist with a voice, UH Hilo Stories, Feb. 20, 2015. 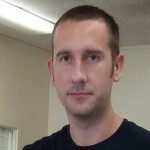 Ray currently serves as exhibit coordinator for the Kahilu Theater Gallery in Waimea on the island of Hawai‘i. A constant theme throughout Ray’s work is her images of water catchment tanks in Waimea. Her exhibited print in this year’s printmaking show, dated 2018, is entitled, “Containment Landscape #23—Mana Road.” The 14″ X 14″ piece is an intaglio print with inkjet print chine-collé. 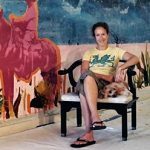 “In my work I have established an iconic language inspired by the rural Hawaiian landscape, where the ‘wild west’ of American myth is here pushed to the edge of westward expansion,” she says in her artist’s statement for the show. “Containment Landscape #23- Mana Road.” Margo Ray. Intaglio print with inkjet print chine colle. 14″ x 14″. 2018. 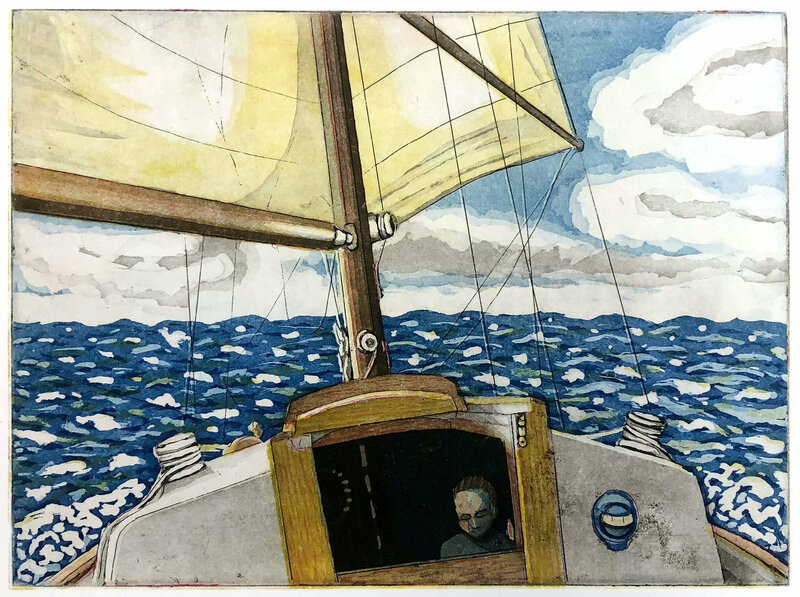 The Annual Juried Honolulu Printmakers Exhibition is juried this year by Jeffrey Dell, professor of art at Texas State University, San Marcos, and is supported in part by the Hawai‘i State Foundation on Culture and the Arts through appropriations from the Hawai‘i State Legislature.